These soft cookies are very lightly sweetened. If you prefer them sweeter, try adding a little stevia with the dry ingredients. In a small bowl, combine the chia seeds (or ground flaxseed) with the warm water and set aside until thickened. In a dry blender or food processor, grind one cup of the oats. 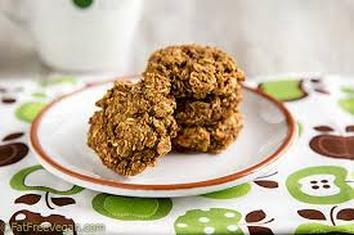 Pour it into a mixing bowl and add the unground oats, pumpkin pie spice, baking soda, and salt. Stir in the raisins. Place the apple, dates, 1/8 cup water, and apple cider vinegar in the blender. Blend until it's about the consistency of apple sauce. Pour it into the oat mixture along with the chia "egg" and stir to combine. Drop by rounded tablespoons onto a baking sheet lined with a silicon mat or parchment paper. Flatten each cookie slightly with a fork. Bake for about 12 minutes. Cool on a wire rack before serving. Notes: Pumpkin pie spice is a combination of cinnamon, ginger, nutmeg and cloves or allspice, with cinnamon being the main ingredient. You can replace it with 3/4 teaspoon of cinnamon and 1/4 teaspoon each of ginger, nutmeg, and allspice (or a pinch of cloves instead of allspice.